Everybody needs a cushion (and maybe a hot cup of tea) around April tax time. As tax deadlines draw near, there are meetings with accountants, searching for all those missing pieces of paper including receipts, logs of travel expenses, and the million other nit-picky items that go into an audit-proof tax return. But if you seriously need an extension of time to file this year, the IRS allows you to take up to six months to complete your taxes (that is, if you don't owe anything) without penalties. There's more information for those traveling abroad at tax time, as well as U.S. armed forces personnel serving overseas on April 15. Find out more about filing a tax extension along with additional tax extension filing advice from top sites on the subject, below. How do I file an extension? 4868 is the form to remember when you're running short on time or you think you might miss the April 15 due date. 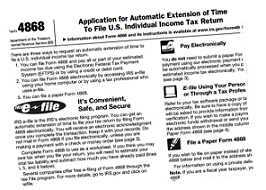 Federal form 4868, or "Application for Automatic Extension of Time To File U.S Income Tax Return" includes the full form and complete instructions for estimating what you may owe, or won't owe. It also includes special instructions for e-filing as well as filing the traditional paper form. What if I can't pay my estimated taxes by April 15? If you are expecting a refund, no more needs to be done than to file the 4868 form for a 6-month extension (usually, until October 15), but if you've estimated that you owe taxes this year, the IRS allows little "wiggle room" for late payment. At least 90 percent of your estimated taxes must accompany your tax extension form. To avoid late penalties, payment can be made by check or, if you are e-filing, by credit card. An interest rate of 1/2 of 1% applies until your taxes are paid. If you cannot pay your estimated taxes by the deadline date, don't bother to file the 4868 form. Simply file your taxes as you normally would and pay as much as you can. The IRS will send you a notice for the balance. This may include additional charges for interest and/or a penalty. Do I also have to file an extension on my state taxes? Yes. States usually require their own tax extension forms to file, and often follow the federal guidelines for allowing a 6-month extension after the filing deadline. Don't forget to file your state's extension form to avoid any additional late payment penalties. What if I'm out of the country around tax time? Special rules apply if you are living or working outside the U.S. on April 15. The IRS allows 2 extra months to file your return and pay any amount due without requesting an extension. This also applies to members of the U.S. armed forces serving in combat zones overseas. For more information, see the Tax Guide for U.S. Citizens and Resident Aliens Abroad.